First off, the background. How cool is that background!!! 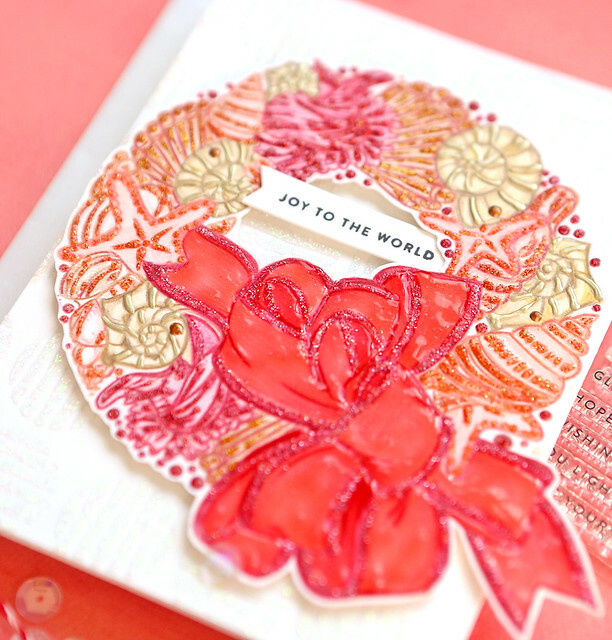 This Line Circles stencil is really awesome and it looks so good used with the Tonic Moonstone Glimmer Paste. I just rubbed it over the stencil using a palette knife on white cardstock. 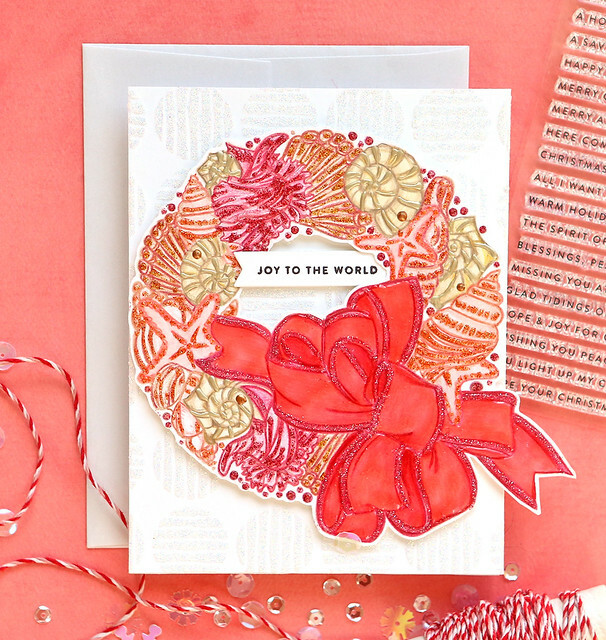 The large wreath is from the new Mele Kalikimaka Stamp Set. 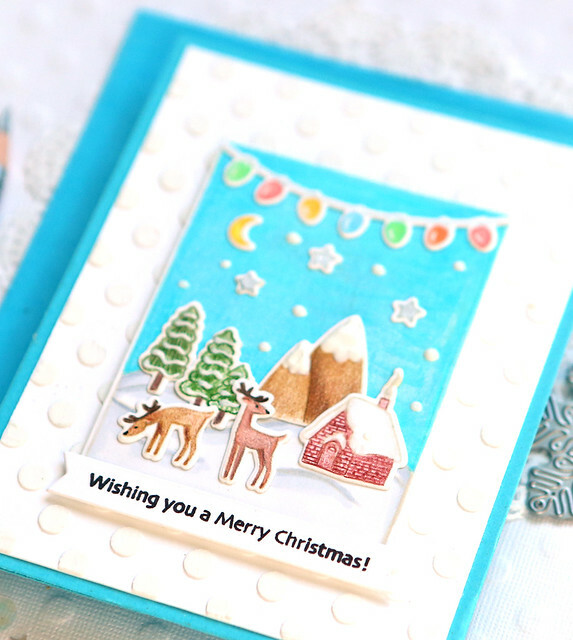 I stamped it with MFT Natural Ink and then colored it in with colored pencils. And then I went all crazy on it adding lots of Tonic Nuvo Drops. I used Strawberry Coulis Jewel Drops on the bow since they are clear. And then I used Ruby Slipper Glitter Drops on the edges of the bow. I used those as well as Orange Soda and Golden Sunset Glitter Drops on the items in the wreath. I also used Pale Gold and Copper Penny. I fussy cut around the wreath as well as an area inside it (I'm sure there will be dies in the future, but I don't mind cutting and it certainly saves money!). I attached the wreath to the background. 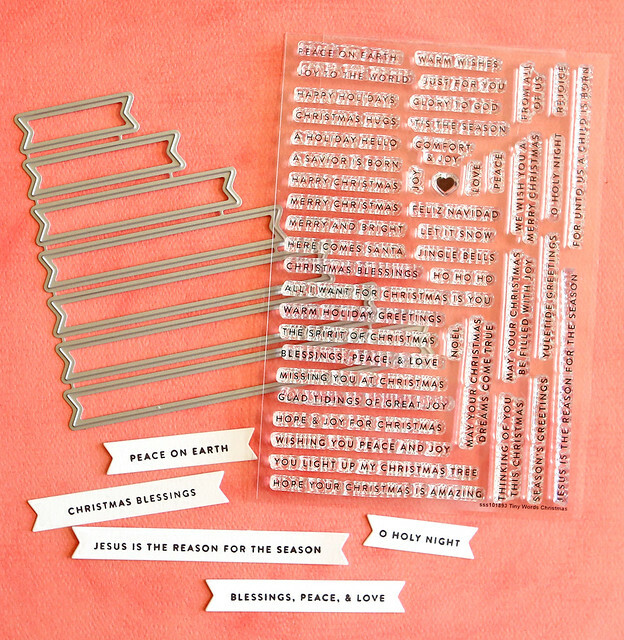 Last I stamped the sentiment from the new Tiny Word Christmas Stamps with Black Intense Ink on a Honey Bee Sentiment Banner (they fit perfectly as I'll show you in an image below). 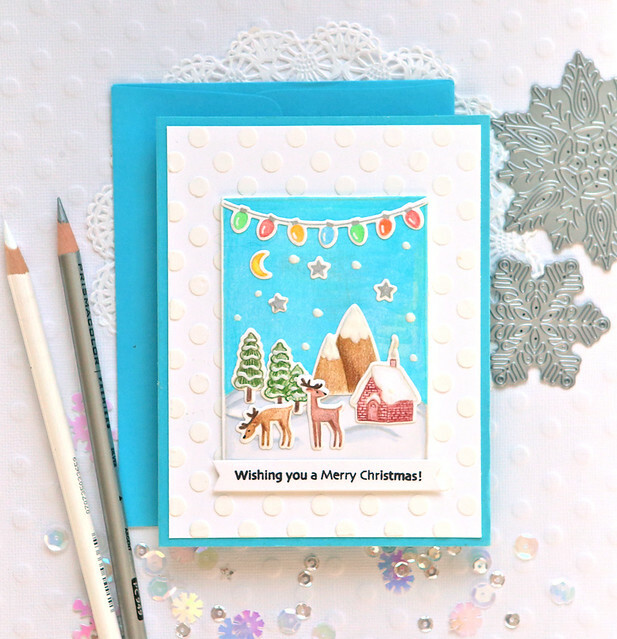 I made the background of this card with Texture Paste and the Medium Dots Stencil. I love the look of white on white so I didn't add any color to the Texture Paste. I just rubbed it over the stencil on white cardstock using a palette knife. 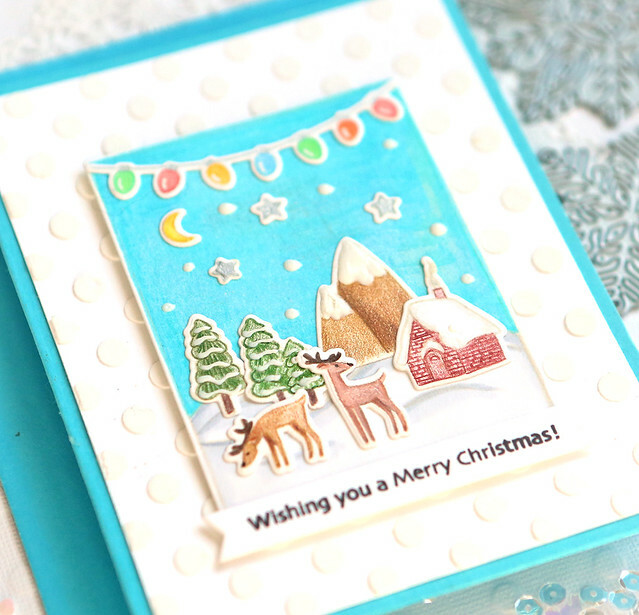 I used the new Winter Scene Stamp set and Winter Scene die set for this card. I stamped the images on white cardstock with MFT Natural Ink and colored them in with colored pencils. After the blue area was colored, I overlapped the pencils with Copic Markers to smooth out the colors. I used a silver colored pencil for the stars. I used foam tape behind the scene and placed it on the background. I added some Glossy White Nuvo Drops on it as snow. I used a stamp from the same stamp set for the greeting stamping it with Black Intense Ink on another banner from the Honey Bee Sentiment Banner die set. 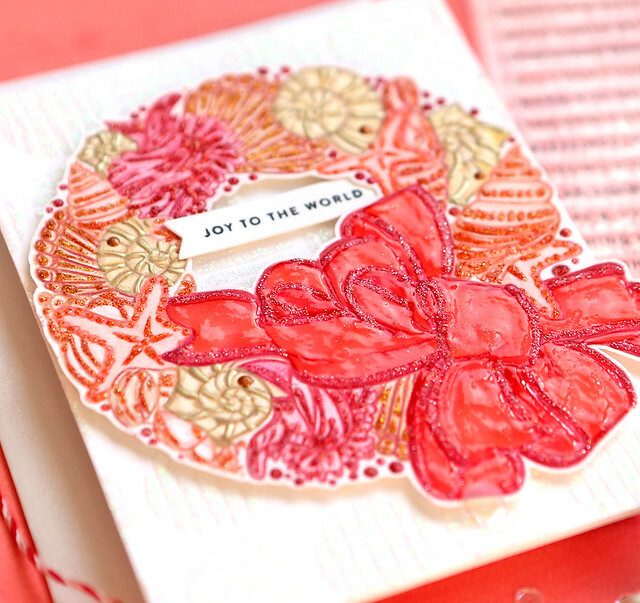 The wreath card is exquisite... so beautiful! My favorite is the wreath card. Stunning. Yeah the wreath is so pretty! Your wreath card is so beautiful and the other is so pretty. 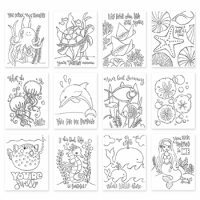 I also love your watercolor cards and ordered them first thing! wonderful cards. Wreath is lovely and the lights are a nice addition to the adorable mini-scene set. Oh I love all these cards!!!! 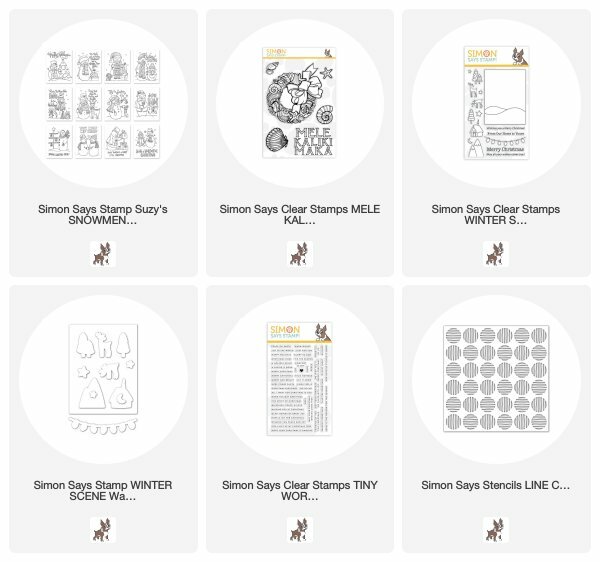 Suzy’s Snowmen would be so much fun to color!!! !